Why Pile? Any things we do are often project-oriented, but the files, applications, task lists, etc. are all over the PC and disorganized. Pile is a place for you to put them all together. Computers are used in pretty much everything that we do nowadays. They encompass the fields of database management, business tasks, conferences, and even education. It results in a mixed-up accumulation of files. The files of your institution’s project that you have to submit, the data of your project, the photos and wallpapers that you downloaded from the internet, the music files, and pretty much all other things pile up in your directory. We are not just listing the issues; we are also here to provide a solution! Pile, a free and open source program can be used to get everything organized. 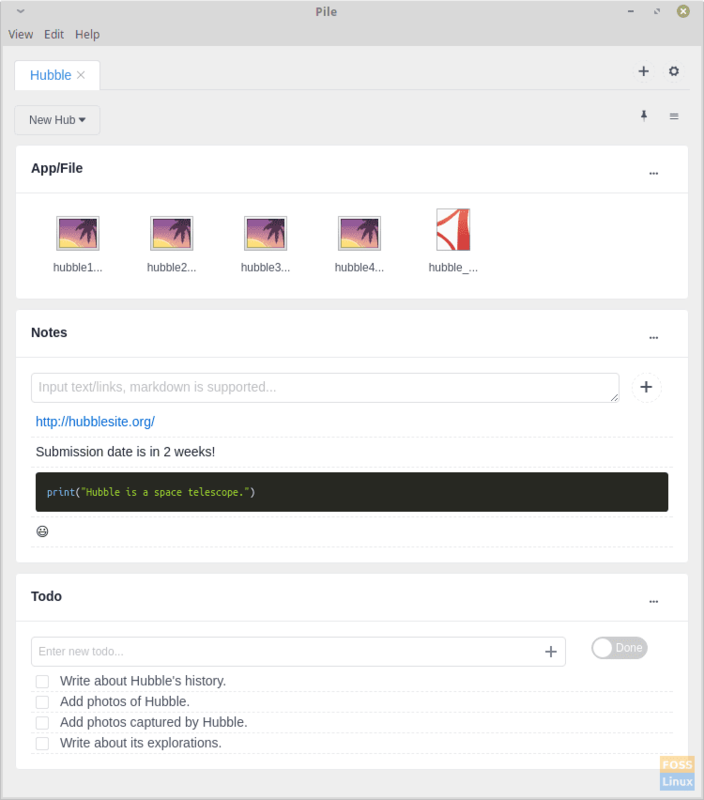 Pile enables users to organize files with a task-list and notes, so that your files are easier to manage, according to your projects. It doesn’t actually move the files around in your filesystem, but simply displays it. Let us go through what this program offers us. Pile has a clean and straightforward interface, without too much clutter or excessive features. The interface has a tabbed interface for different projects. You can rename/delete these hubs. You can even add a kind of hub more than once to a board if you want to categorize the similar type of files. Below is a brief see-through of these categories. You can add any project-related files in this section. It includes images, PDFs, programs, or whatever you want. The files will not be moved in the real filesystem but will appear arranged here. You can rename the data here, but again they won’t be renamed in the filesystem. To add files, users have to drag-and-drop them. You can click on any of these files to open them. In this hub, you can add your comments about the project, or even add links to any website. Apart from that, the Pile also supports Markdown. Markdown is a simple markup language that can be used to format text. For example, if you put something between <p> and </p> tags in HTML, it comes out as a paragraph. Similarly, for Markdown, specific ‘tags’ can be used to display codes, lists, tables, links, etc. Get the full Markdown cheatsheet here. You can also add emojis. To-do list lets you list the tasks you have to complete for your project. There is a simple checkbox button that you can check off after the job is complete. You can turn the slider to ‘Done’ when you have finished all the tasks. Other than these, you can switch the language of the program from English to Chinese. You can also rename the boards. 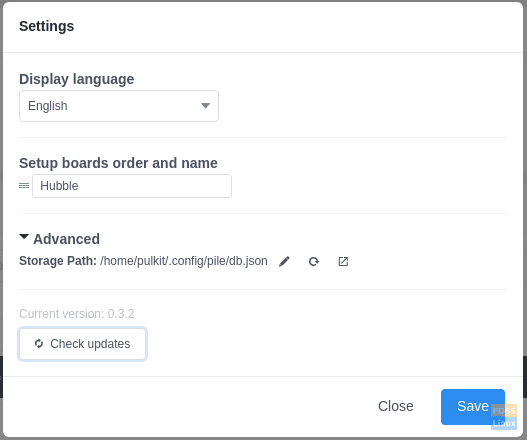 There is an option to change the location of the file where the configurations of these boards will be saved. Finally, you get an option to update the program. You can download the program file from this link. As you’d see on the website, the download is available in AppImage format, which is a portable format and can run on almost all Linux distros. Simply download and run it. Even though the program is ready to run, Linux doesn’t allow strange programs to be executed by default. So you’ll need to add the permission to execute it. Press the Tab key where mentioned, and the Terminal will auto-complete the name. Now you’re ready to launch, so open your file manager and double-click on the AppImage. 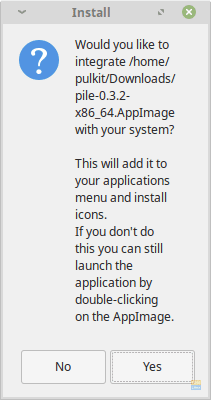 You’ll be greeted with a window asking whether you want to install this program on your system so that it appears in the application menu. We recommend agreeing to it for added convenience. 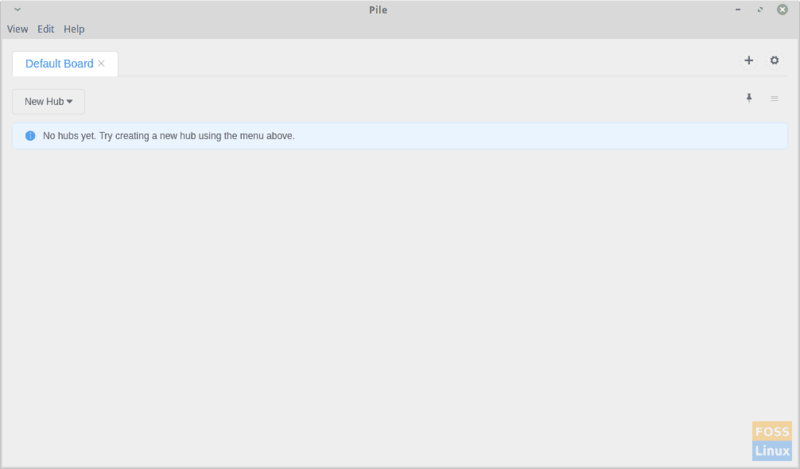 Pile is an excellent utility to organize files and be free from the files clutter that gathers in your filesystem. Though it takes some time to create projects, tasks, and organize within the Pile interface, the work is priceless, especially for those involved in a variety of projects and things gets too complicated leading to untraceable files. Let us know what you think about this program in the comments. Cheers! Pulkit Chandak is a Linux enthusiast and has been using and experimenting with open source software, and hardware too since a long time. He is a huge admirer of open source software and wants to ventilate it to all around him. He is interested in reviewing and writing tutorials on Linux and its innumerable distributions. He believes that freedom in software leads to freedom of the mind from the chains of limits.